While it is a competition, the WKU planning committee uses the theme “Give Red Give Life” to emphasize that every donation can save up to three lives. Last year, WKU collected enough pints to help nearly 1,200 individuals, according to the American Red Cross donation records from the event. This donation, however, fell short of MTSU’s donation. Now, WKU needs your help to beat MTSU and show that the Hilltopper Family can come together to Give Red Give Life. This year’s blood drive winner will be announced during the WKU at MTSU football game Nov. 2 in Murfreesboro, Tennessee. Donors can visit www.wku.edu/givered and follow the link to schedule an appointment. Individuals may also call 1-800-RED CROSS (1-800-733-2767) to make an appointment. There will be designated parking for community members who are scheduled to donate. In addition, presenting donors will receive a commemorative WKU vs. MTSU T-shirt while supplies last. To save time, the American Red Cross encourages donors to use RapidPass. It allows donors to complete their pre-donation reading and health history questionnaire online, on the day of their donation. Visit RedCrossBlood.org/RapidPass and follow the instructions. According to Tiffany Taylor, American Red Cross External Communications Manager, all blood types are needed to ensure a reliable supply for patients. A blood donor card or driver’s license or two other forms of identification are required at check-in. Individuals who are 17 years of age in most states (16 with parental consent where allowed by state law), weigh at least 110 pounds and are in generally good health may be eligible to donate blood. High school students and other donors 18 years of age and younger also have to meet certain height and weight requirements. 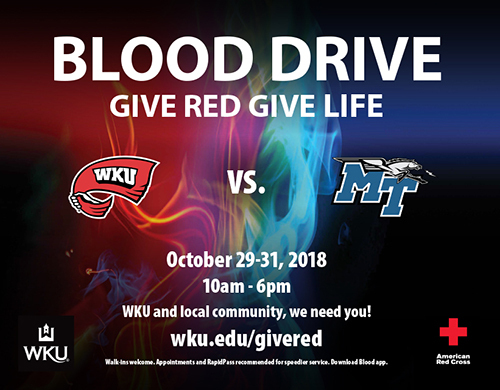 The WKU vs. MTSU Blood Drive is coordinated by WKU Student Activities and American Red Cross with support from WKU Athletics, Health Education and Promotion, and Public Affairs. For information, visit www.wku.edu/givered or contact Andrew Rash at andrew.rash@wku.edu or Tiffany Taylor at tiffany.taylor@redcross.org. The American Red Cross approved offer reference for the T-shirt giveaway is - 2018-APL-01402.